The winter storm battering parts of New England Monday isn’t expected to drop 2 to 3 feet of snow in one go, but officials warn that wild winds and blizzard conditions could still cause power outages and tree damage – and make for an uncomfortable, if not dangerous, commute. The National Weather Service has issued blizzard warnings from the south of Boston to the South Shore, while areas of eastern New England – including Boston, Hartford, and Providence – are under winter storm warnings. 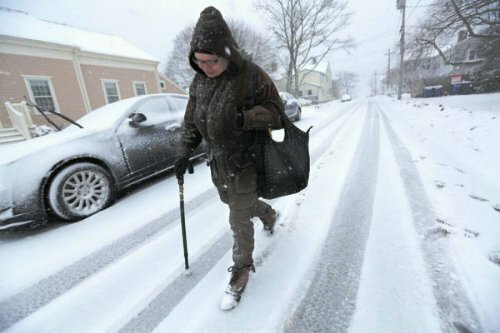 Snow, which began after 8 a.m., may fall at rates of more than an inch an hour in parts of eastern New England, The Weather Channel reports. But “[i]t’s not just the snow we are talking about – very strong winds, coastal flooding concerns – there could be some power outages, especially south of Boston,” said Cindy Fitzgibbon, meteorologist for Boston’s WCVB 5. The winter storm, dubbed Mars by The Weather Channel, is a result of a low pressure area off the East Coast – an area that went through what meteorologists call “bombogenesis,” or a sudden central pressure drop of at least 24 millibars in 24 hours. Winds of up to 45 miles per hour could blow through eastern New England, while the gusts could hit up to 65 miles per hour on Cape Cod. Massachusetts Gov. Charlie Baker also asked residents to stay off the roads when possible.